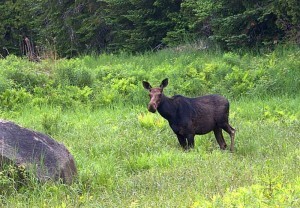 One thing our guests staying in Freeport Maine at our Bed and Breakfast often ask is where you can see a moose in Maine. 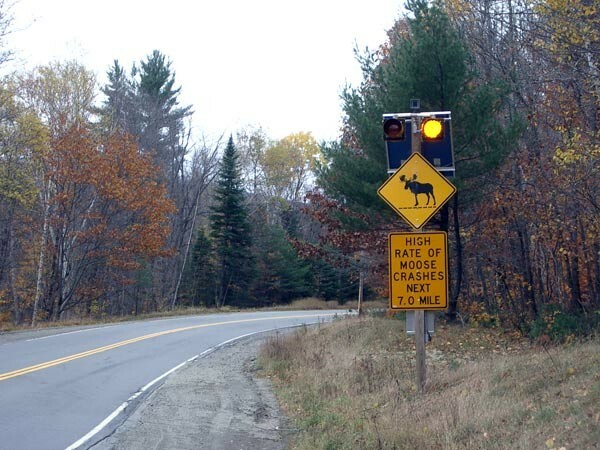 Just a mile or two north of Brewster House on US-1 is a “Moose Crossing” sign, though we’ve never seen a moose in that area (we thought perhaps they couldn’t read the sign, so didn’t know that was their designated “crossing”). However, a few weeks ago, an early-rising guest drove up that way in search of a local donut shop, and happened to see a moose not far from the sign! The next day he saw it again! If you aren’t interested in an early morning moose-hunt from Brewster House, you may prefer a day trip to see moose in a location with a much higher probability of success. A drive of just a bit more than two hours to the north and west of Freeport will take you to Rangeley, Maine, where Maine Route 16, affectionately known as “Moose Alley”, can be found. If you arrive in the middle of the day, there is little point in looking for moose, as they are most likely to be napping. They usually are out near dawn and dusk. Instead, spend some time driving around Rangeley Lake – it is surrounded by Maine Routes 4, 4 and 16, 17, and South Shore Drive. The drive around the lake is stunningly beautiful, and the mountains around it give it something of the appearance of Lake Tahoe in California (and Nevada). If you go before September-October, the bulls will still have their antlers, which they lose during their annual rut in the autumn, then grow them back in the spring. As dusk nears, head out of Rangeley on Route 16 (being careful to drive at or even below the speed limit – you do NOT want to collide with a moose when you crest a hill or go around a bend in the road). Keep your eyes on the road, and especially along the shoulders, as the fading light, and the dark color of the moose, can make them appear out of the shadows quite suddenly. Keep your camera handy, and be ready to stop! When we went in October, there was a moose just a short distance from Rangeley, standing along the shoulder of the road. Another time, in the spring, there was a moose drinking from a small creek along the road. Enjoy the search as much as the discovery, as the area is beautiful, and well worth a visit for that reason alone. As darkness falls, carefully return to Brewster House and your bed!